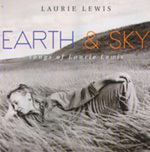 CD review: "Earth & Sky"
This review first appeared in the September 5, 1997 edition of the North County Times. Laurie Lewis ie one of those many singers whose style can't be neatly pegged into a ready-made format  and so she's ignored by the radio moguls who increasingly make our airwaves so damn boring. Lewis is a fine singer and even better fiddle player. She's so good that she was featured on the all-star women's bluegrass project, "Blue Rose," on Sugar Hill Records (which you really ought to own if you at all like American music). But her greatest talent is her songwriting. Like Tom Russell or Guy Clark, Lewis writes smart little tales of average folks, the people both political parties claim to represent every election season then promptly forget. On this compilation drawn from Lewis' three solo releases on the now-defunct Flying Fish label (now owned by Rounder), Lewis is joined by some of the best country and bluegrass players around: Jerry Douglas, Tony Furtado, Mike Marshall, Buddy Emmons and Sam Bush. Of course, every once in a while one of these no-name talents breaks through into the mainstream. If you've enjoyed Lyle Lovett, Emmylou Harris or Ricky Skaggs, for instance, then you might want to give Laurie Lewis a listen.